Fish Skull Living Eyes are incredibly realistic and a great way to add life to your favorite streamer patterns. 8.5 mm. Eyes: 16 per pack. 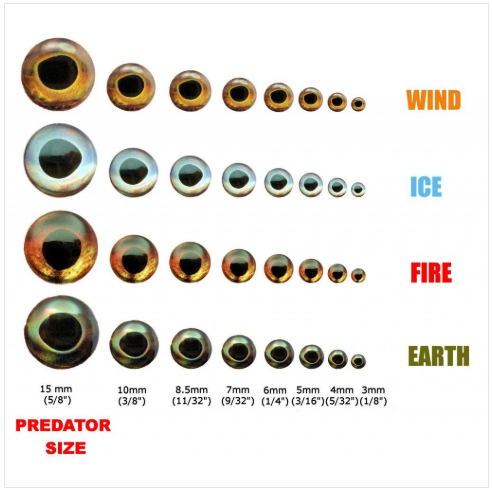 6 mm Eyes: 20 per pack. Fish Skull Living Eyes are designed with photo-realistic holographic technology and high-resolution images of real baitfish eyes. All four colors come in an array of sizes that are designed to fit everything from smaller trout patterns to huge predator-style flies. Fish Skull Living Eyes have an adhesive backing, but we recommend that you use a Super Glue, epoxy or UV Resin to stick them securely onto your fly.